Ask any of the "regulars" who post on the RV Pet Stop section of the Good Sam Club’s online forum and they'll tell you Richard Daniels is a real life-saver – especially of the four-legged variety. Last year, the resident of Waynesboro, Georgia, and the Old Fella Burke County Animal Rescue network helped foster and find homes for 211 abandoned or stray dogs and cats. This year, the work continues as Daniels and rescue volunteers continue to make a difference in the lives of these "orphans". But Daniels would be the first to tell you that many of these rescues wouldn't be possible without the support he receives from members of the Good Sam forum. Many animal-loving members of the Club read and post in the long-running "Old Fella" thread, which now has close to 14,000 posts. They call themselves "FOOF"s – Friends of Old Fella, named after the dog that inspired the rescue network in Burke County. Earlier this year, Daniels was named the Good Sam Club's 2008 RVer of the Year for outstanding achievement benefiting fellow RVers and the community. He will be honored April 20th on Good Sam Day at The Rally in Albuquerque, New Mexico. He and fellow FOOFs from the online forum will be camping with their "fur babies" (as they affectionately call their four-legged friends) at The Rally. Daniels plans to bring two of his dogs, Peaches and Suzie to the event. The couple's other two rescue dogs (Mama and Hobo) and Izzie the cat will remain at home. Daniels describes his work finding homes for rescues as "never ending," but well worth the effort. "That's what it's all about, when you deliver a dog to a home and see the happy faces and that wagging tail," Daniels says. "It's all worth it." And time after time, RV Pet Stop posters come through – with monetary donations to the Old Fella Rescue network, offering advice and moral support, and sometimes even adopting or fostering the strays. "I cannot thank the people of this forum enough for all that they do," notes Daniels. "I don't know how many times the FOOFs have stepped up to the plate when it counted to bring about a happy ending to a story that could have been tragic." Sandi Childs, known as ElBigDodgeO on the forum, read about the kitty crisis and immediately contacted Richard and offered to care for them. Childs lives with her husband, Matt, in Weaverville, North Carolina, and has fostered rescue animals before. Plans were made to have the kitty transfer take place in Florida, where Childs was visiting. So on a brisk weekend in late February, Richard and Sue Daniels made the 500-mile trek to North Beach Camp Resort, a Good Sam Park Augustine, Florida carrying their precious cargo: a mama cat and five newborn kittens. According to Richard, all of the cats immediately took to RVing and did "very well" on the road trip. The kitty transfer went off without a hitch. The couple had planned to foster the mother cat and kittens until they were weaned, but due to unforeseen work and family issues, they found a member of a rescue group in western North Carolina to take over caring for the mama cat and her kittens. They will stay there until they are old enough to be placed in "forever homes." 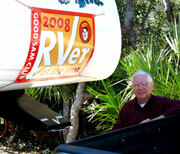 While staying at the Florida campground, Richard proudly displayed his RVer of the Year banner, attracting interest in the Good Sam Club and the forum from fellow campers. Richard says since being selected RVer of the year, "It's been a whirlwind." Looking back over the past several years, the retired minister can't believe how many lives have been touched and abandoned animals saved, all because of his and Sue's encounter with a scruffy, homeless black dog in a Modoc, South Carolina campground over Labor Day weekend in 2005. After returning home from the trip, Daniels couldn't get the skinny dog with the sad eyes out of his mind. Known as Dixie Flyer on the forum, he started the "Very Old Stray (the Old Fella Story)" thread, asking fellow forum members for advice about the stray. He was thinking about bringing the old black dog to live at his home. The encouragement he received from forum members inspired him to return to the campground and adopt the dog. His online friends encouraged him every step of the way, with many sending in donations to help with the dog's mounting veterinary bills. But it didn't stop there. Daniels' chance encounter with the old stray, eventually led him to the founding of the licensed Old Fella Burke County Animal Rescue network. The grassroots rescue effort not only assists in fostering and placing strays, but also provides obedience training and subsidizes spay/neuter surgeries for these animals. Sadly, on June 28, 2008, Old Fella passed away due to complications caused by bone cancer. Old Fella lived with the Daniels family for only three years, but his legacy remains an inspiration to the many volunteers who work actively in the rescue movement. Old Fella, and the cause he inspired, will be honored with the dedication of the Old Fella Memorial Statue on April 30 in Waynesboro City Park. To read more about the story of Old Fella or participate in the forum, visit RV Pet Stop.